My work here at Aspen Research involves solving problems for clients. Sometimes they are simple analytical requests, sometimes they are failure analysis, sometimes they are product development, but one class of projects stands alone. These are what we call "Holy Grail Projects". These projects always seems to come from a new client, and they throw at us some problem that is industry wide and plague everyone in it, something along the lines of "make it twice as good at half the price without making any capital investments". They can even involve something that borders on being physically impossible or unreal. There are always lots of snarky comments that can be made ("Once we do that, you'll save even more money by eliminating your sales force and having my 7-year son sell it") but I've always had the good sense to force those ideas from my head and focus on the problem at hand. Clearly the problems can never be solved as proposed. Everyone's been looking at it for years or decades and tried all the obvious solutions. So then it's a matter of redefining the problem. My usual approach is along the lines of something attributed to President Eisenhower: "Whenever I run into a problem I can't solve, I always make it bigger. I can never solve it by trying to make it smaller, but if I make it big enough, I can begin to see the outlines of a solution." That doesn't always work, but it certainly is a great way to start. I mentioned earlier this month that phosgene is the real concern in manufacturing polycarbonate, not the BPA comonomer. Unfortunately, a DuPont worker was killed this weekend from phosgene exposure. I ran across this first at the Chem Blog. There is a very strange image on the page - what appears to be an old poster with an elephant (!?) - also warning of phosgene's dangers. I suppose that for sufficiently vague values of 2 it is. The IP Watchdog has a nice entry today about patent searches. Some of the points that he makes are nothing new, but I've never before thought of or heard of them applied to patent searches, such as the idea that as the certainty of the result increases, the expense in getting there does too. This is a standard idea from statistics, but then this leads to some interesting outcomes. If you are just applying for a patent, there is not as strong of a need to be 100% certain that there is no prior art as that would be too expensive at the application stage. At later stages (i.e., entering production), the need to reduce risk increases, so there is stronger justification for spending more on a more detailed search. One line from the blog may raise your eyebrows: "In patent litigation it is not uncommon for defendants to spend upwards of $1 million looking for prior art, sometimes substantially more." The million dollar figure would only apply to the biggest of infringement cases, but considering some of the sums that Article One Partners is willing to lay out for just one good bit of prior art, I can easily see a million dollars being spent. In this day of trivial internet searching, it is easy to get complacent and assume that everything of importance is on line. Book are a huge exception, although that is slowly changing, but the difficulty is that they have to be manually searched (after being manually located!). A patent examiner is a lone individual looking for prior art, so it can be safely assumed that they will occasionally miss something. But when a patent is issued, the whole world can suddenly be looking for prior art, sometimes forcing the whole novelty story on a patent to quickly change. Getting a patent is easy, keeping it is difficult. In my current job, we get clients from a very wide range of industries. While we try to solve their problems by focusing on the scientific fundamentals (those elements that cut across all industries) it still helps to know what some of the issues (and even the terminology) are in specific industries. So we get a lot of trade journals. Here is a short list of what I have on my desk at the moment. Some of them may seem like obvious entries, others may not. (These are the result of work in the past). I don't even know what the acronym in the last two are! There are certainly plenty of others out there that I could get, but you get the point - we really do work broadly and do not specialize in any industry. Following up on the rubberized race track surfaces from yesterday, Bayer has announced that they have developed a viscoelastic carpeting. It's going to be commercialized by an outside partner (good move) but could be fun. I wonder how the beater brush on vacuum cleaners will react? Yesterday's post mentioned the most downloaded data sheets in 2009 from IDES database. While I did mention that Lexan held the number one position, I should have also noted that Makrlon (BASF's polycarbonate) was #7 on the list. Also, Cycoloy, the PC/ABS blend from Sabic is at #5. I'm not sure that I understand why PC is so high on the list, as it is certainly not the largest volume for polymers - PE, PP, PVC, PET, PS. So why so much interest in PC? #2 on the list is Zytel, a nylon 6,6 from Dupont, also not a really large resin. You can get the complete report and scroll down to the bottom (63 pages) where 16 different resins were all accessed just 1 time. Tisarbon caught my eye as a fun name, and quite surprisingly, it's a PC as well. Another one hanging-on at the bottom of the list is FPD Blue, a fluoroelastomer for use in flat-panel displays (hence the name). That this is here is not surprising as fluoropolymers are definitely low volume. Both of these polymers are already off to a good start for next year - the fact that I accessed them means they have already been accessed as much this year as last year. 1 more access from a dear reader and they will be up 100% for the year. Polycarbonate is in the news quite a bit and even bigger in the blogosphere, so it might be worth a bit of effort to look at it a bit closer look. The R1 and R2 are generic and can be just about anything. That's why polycarbonate can refer to family of polymers. A common example is CR-39. The resulting structure has none of the chemical properties of either BPA or phosgene, which is a good thing: as bad as BPA seems to be, phosgene is far worse. It's a gas that was used in World War I as a chemical weapon. So why the concern about BPA in polycarbonate, and why not phosgene? 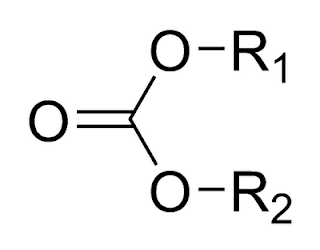 No matter how carefully a polymerization reaction is carried out, some monomer remains unreacted. The polymer can only react with monomers at the ends of the chains and there are very few of them making it difficult for the monomers to find them and react. BPA is a solid at room temperature, so the unreact portion stays in the plastic only to come leaching out later. Phosgene, on the other hand, is a gas, so any unreacted portions are able to quickly volatilize especially with a little heat to help. The most common tradename for polycarbonate is Lexan. In my mind, it's becoming a generic term much like Plexiglas is for polymethyl methacrylate. This might have contributed to "Lexan" being the most searched plastics on the IDES database in 2009. Or maybe it was because of the BPA scare. But let's be perfectly clear on one thing here: BPA is not a plastic, it is not even added to plastic. It is used to make a plastic. Physicists have always found a good way to get the general public interested in some of their most arcane research - by using amusing names for things. Subatomic particles have "flavor" and "charm" and "color", words chosen strictly for their general appeal, as no one ever has and ever will lick a quark to see what their flavor is like. In the same vein, color is meaningless in the subatomic world where the wavelengths of light are far too massive to interact with a quark. We can't "see" them with visible light, so they certainly don't come in red, blue or green. Chemists have not found this pathway - we speak in jargon that only other chemists can hope to understand. But for some strange reason, there are more and more rheological models of polymers and other long molecules that have amusing names. It's long overdue. Look at the history of rheology modeling. There are such beautiful names as the 8-constant Oldroyd model and the Zaremba-Fromm-DeWitt model (ZFD for short), all of which are good for commemerating the discoverers but not for exciting anyone about the model at all. The first big break came from Doi-Edwards - the reptation model, although you would have to know that "reptation" refers to the crawling motion that reptiles make. Things have progressed from there. Larson developed the Pom-Pom model, and now there is the Rolie-Poly model from Likhtman. The problem with this last one is that Rolie-Poly is an acronym for ROuse LInear Entangled POLYmer. But since there is already an extended reptation theory and an extended Pom-Pom theory (plus a modified extended Pom-Pom theory too! ), even the best of names don't last long. Unbeknowst to most of you, there is a huge ongoing comment war on a old post. I love the multilingualriy of the rivalry with one side pushing "Viagara" and other pushing "Cialis". You can see where this will end up. I've made adjustments so that all comments on posts more than 30 days old will need my approval. Further changes may need to be made in the future.